One of the first questions you need to answer when making the ATS comparison is whether you want an applicant tracking software solution installed on your own server or hosted by your software vendor. 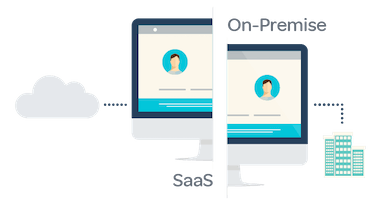 The old way of purchasing was to get “on-premise” software but in recent years this has been overtaken by software as a service providers (SaaS), companies who host the software on the cloud and offer it as a service online. There are advantages to both solutions but the momentum is firmly with SaaS, which in 2016 overtook on-premise solutions across the entirety of business software. Updates to the software are the responsibility of the vendor. Removes the need for an IT department. The nightmare scenario for any growing business that invests in the best applicant tracking system for their needs, is for the vendor to then close down for its own business reasons. Yes, this has happened, ask anyone who worked at T-Mobile or a ton of other businesses who had the ATS they were using shut up shop. Due diligence in this case means asking the right questions about vendor viability. Another route altogether is an open source applicant tracking system. The advantage of this option is clear: it’s free, and you can modify the software as you please. Where’s the catch? Do you want to manage your hiring or to rewrite software? Unless you’re more than tech savvy or have an IT team that can afford to spend the time, you will run into issues installing, running and integrating one of these systems. And when you run into those problems there is no dedicated support to turn to. We use Workable to set that tone that we're a forward-thinking and professional organization and place to work. We'd searched for a while to find the right system to help us with our hiring process. We were looking for: (1) easy to use, (2) sophisticated and customizable, (3) something that made sense for a small business, (4) a centralized location to manage our hiring process, and (5) had a no-hassle trial. 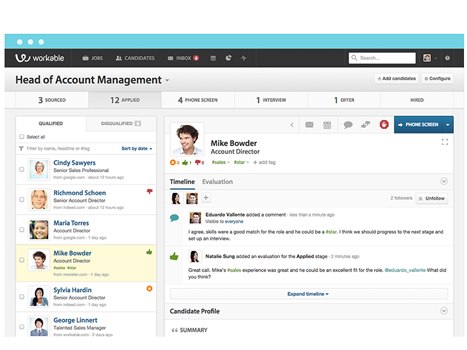 Workable delivered on all of those, and has also increased our pool of qualified applicants through their free integration with several job sites. As we used Workable we also recognized its powerful potential to help us pre-qualify applicants -- a total bonus that we hadn't thought of yet. Does your ATS match your company profile? The three main categories are enterprise, staffing agencies and SMBs. There are good solutions for each of these categories but these are big tents — think clearly about which one you belong in. Does the ATS provide real ease of use? There’s no point in investing in software that no one can or will use, or that is stuffed with features that you will not need or use. Look for an intuitive design that your hiring team will buy into. There are systems that require no installation, training or manuals. Does your ATS enable you to post to multiple job sites ? Overwhelmingly the most important feature for smaller companies. Check which jobs boards and social networks the ATS is integrated with. What kind of search capability does the ATS have? Make sure that it boasts a fast, accurate search with results organized in a logical and intuitive way. Does your ATS offer strong customer support? This can quickly turn what looks like the best applicant tracking software into an expensive farrago. Be clear over response times and availability in your time zone. Check to see how well organized and detailed the support section of the ATS website is. What kind of reporting does the ATS offer? Be clear about your own reporting needs to track your recruiting efforts. Make sure they are matched and covered before making a choice. Does the ATS enable employee referrals ? Referrals are the oldest and still the best method of finding employees. The best applicants tracking system will provide you with a clear way to attract and reward referrals from your team. What kind of candidate experience does the ATS offer? 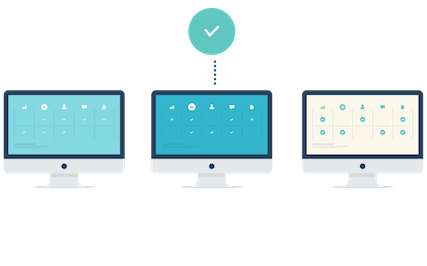 Your team is not the only user of the applicant tracking system, there’s also the candidate to consider. You will lose valuable prospects if its application process is clunky and off-putting. Check your applicant tracking system vendor’s viability. You want a solution that will last, make sure the same applies to your vendor’s financials. Get references for an ATS like you would for a hire. There are tons of applicant tracking system reviews online, take them into account. From Trust Pilot to Capterra and Software Advice to Getapp , check what other users are saying on third-party review sites. It has become standard practice to work on the move. Smartphones and better software allows us to work when and where we want to. Your ATS should not be the exception. The whole of your hiring team should be able to review candidates, schedule interviews, leave feedback and check the pipeline via your ATS on the device of their choice. The best ATS options have useful integrations. Check for integrations with leading and niche job boards and for sourcing tools that help you source and attract passive candidates. Your ATS should help you get more candidates by getting your job in front of prospects you can’t reach when you’re manually posting jobs to job boards. Does the ATS offer easy integrations for background checks and with a modern HRIS, like Namely and BambooHR ?